There is a division among Christians, notably within the United States (where one would expect a division to be, what with its distinct Christian history and development) on the manner of religious music. I belong to the old school, with the emphasis on liturgical music that reflects a scriptural basis. By way of explanation, I submit a fine example for this Christmas season. It is a fitting place, then, for a hymn dedicated to the idea that the birth of Christ is likened to the flowering of a tender rose, in a place so battered and besieged, physically and spiritually, yet which still can bring forth such ethereal harmony to praise the Christ arisen. The hymn can be traced back at least to the late 16th century, and the harmony was set by the German composer Michael Praetorius in 1609. The lyrics were translated by Theodore Baker in 1894 into Lo, How a Rose E'er Blooming, and the music was also used for the hymn A Great and Mighty Wonder. Though hardly an authority, I nevertheless consider music of this sort, classic in the true sense of the term, to be the well-spring of liturgical music, not to be confused with other music heard in present churches, or the radio. American Gospel, both black and white (separate but equal, as it were) is a musical category unto itself, and many can enjoy it without ever considering its message. Don't get me wrong, I am among its fans, though my consideration of its lyrics as religious or nostalgically entertaining depends on my mood. There are many in what can be categorized as the charismatic movement and its ripples that have diverged into a New Age mesmerizing chant, which can be summarized with the example of "You are the light of the world" (repeat 27 times, affettuoso accentato). For those who receive spiritual nourishment from such music, all the better, but I do not believe that it rises to the intent of such hymnodists as, say, Charles Wesley or Martin Luther. This is clearly an unresolvable discussion, but the appeal of this German hymn is ever enchanting. This beautiful cathedral was almost completely destroyed in 1945 by Allied bombing. Dresden was leveled around it. The Russians, and shortly later the athiest Communist East Germans, cared nothing about churches, so this beautiful church, the center of Dresden, was deliberately left as a pile of rubble while the public buildings around the central square were rebuilt and put back into use. 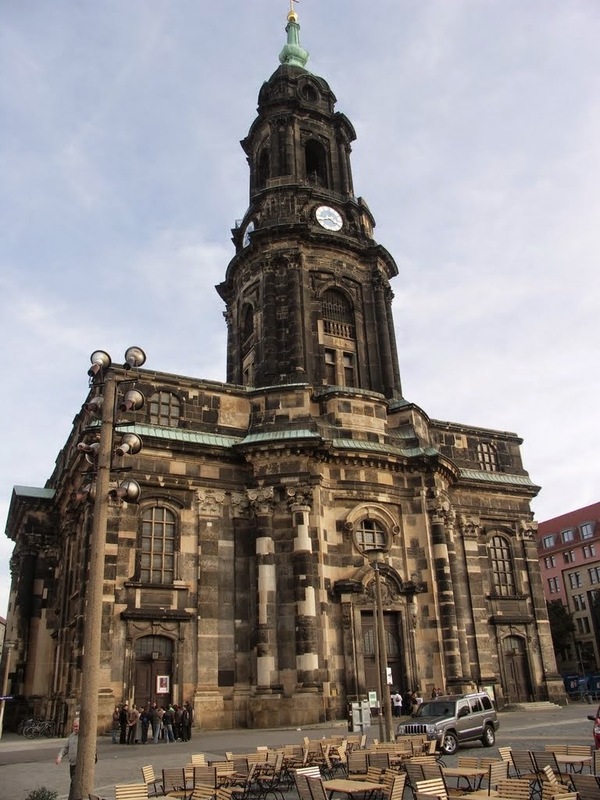 After German reunification the citizens of Dresden wanted their cathedral back. They raised 2/3 of the necessary money and a team of archeologists, construction men and architects painstakingly deconstructed the rubble piles---17 tons of stone---and marked every piece that was identifiable and useable. That's why the building's exterior looks like it does, a checkerboard of old and new stone. It reopened in 2006. The interior is gorgeous, with the paintings and windows faithfully redone to the exact original drawings and pictures of the pre-war interior. (Fortunately the original architect's drawings and plans survived the bombing.) We were in Dresden last month and we toured the building. Its beauty makes your heart catch in your throat, and the faith that reconstructed it made its own miracle.